Oh and btw this cheese ball is super yummy. We made this just to photograph it and it was gone in a few days with only 3 people (well really only 2) snacking on it. It's my favorite go to cheese ball recipe. 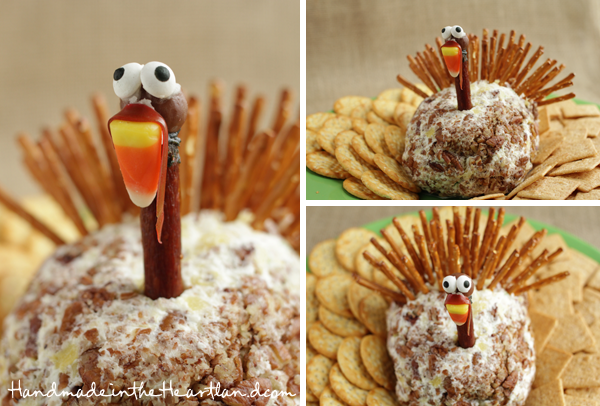 To make the turkey "feathers" stick your pretzel sticks into the back 1/2 of the cheese ball. To create mr. gobblers head take a stick of beef jerkey and "glue" a whopper candy on top with icing. Then attach the nose and eyes also with icing. We made the gobbler by cutting a little strip of fruit roll up and then laying it over the candy corn.